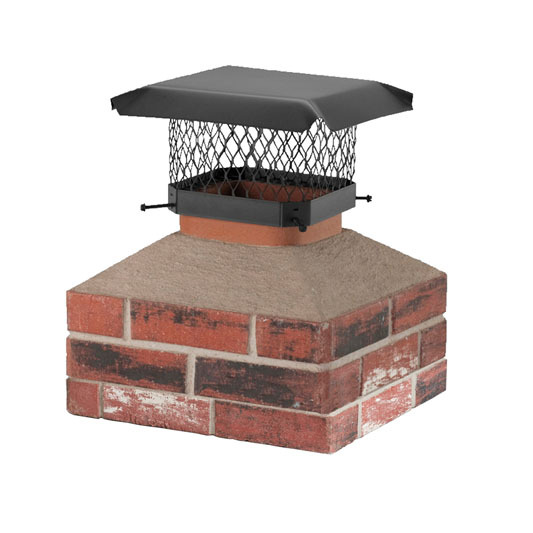 The Black Galvanized Steel Shelter chimney cover (California-compliant model) is the durable and economic choice for chimneys in most regions. The outside mounting design provides maximum free air space and better draft while the attractive powder coat finish helps it stand up to the elements. Made with a 24 gauge galvanized steel hood with scalloped corners and roll-formed edges, 18 gauge 5/8" expanded galvanized steel mesh, 14 gauge galvanized steel base and slotted hex-head bolts. Seven year limited warranty. 5/8" mesh makes this cap California regulation compliant. Made with 5/8" expanded metal mesh. California and Oregon compliant chimney cover.